SCANNING: Most of the latest pictures were taken with my Sony DCR-TRV30, or by the old TRV-11. 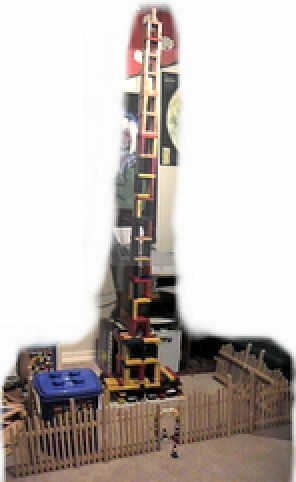 Some of the older pictures were taken by hooking up a Snappy scanner (by Play Inc., now defunct) to a camcorder, or by using the Lego Cam. Older pictures originally taken on film have been scanned using an HP ScanJet 5470c. I usually snap several floors at a time, then put them together and retouch using Adobe Photoshop. Now, then: The towers are listed in chronological order, starting with most recent. Click on the tiny thumbnail picture to see the larger pictures. This is the first tower to be built in a different place -- at my apartment. With the 10' ceilings and lack of a foyer, I decided use the broad foundation floor style seen on only the lower floors of other buildings throughout all floors of this building, thereby making the tower appear much broader. Presumably it makes the tower more stable, aerodynamic, and perhaps impact-resistant. 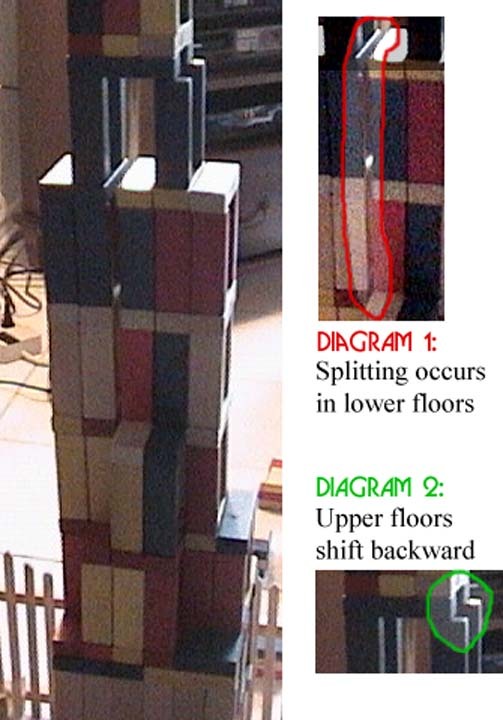 The bracing above every floor through 19 makes the tower about 7" taller than a typical 22-story design. The 2nd through 19th floors use exactly one-half a set of Jengas. After I received two more packs of Jengas, I felt the need to build another tower. I decided to build this tower next to Bona Fortuna in order to save it for a tower party, and with that, have made the first Jenga complex! This tower received a blow on 10/23 while I was away at a band contest. Based on the rubble pattern, it is supposed that it was impacted from the front, and it bounced off the wall. Most fell forward, some fell behind Bona Fortuna, and it is suspected that some of it fell onto Bona Fortuna due to the extensive damage on its lobby floors and the fact that its three top floors (32-35) are missing. The bottom of this tower still leaned up precariously against the wall until an unsuccessful repair attempt on 11/26. The tower was rebuilt on 12/4/04 in a form invented by Andy Edwards, but it too was subject to some unknown force and was later destroyed. In early January 2005, all the extra blocks were incorporated into decorating the lobby of The Phoenix. Also built in foyer. It was difficult to be able to add 5 more floors (including 3 more "lobby" floors) on just 54 more blocks than previously used. This is the tallest tower ever constructed by me. Also unlike the previous tower, it was completed in only two weeks, with most of the work occurring on the first day and none at all toward the ends of the 2 weeks. 9.5 floors were built on the last day of construction in a pattern referred to as "Sunday Blitz." I also broke the storm door frame in an effort to protect it from the wind as I removed the 12-foot-tall ladder from the house. 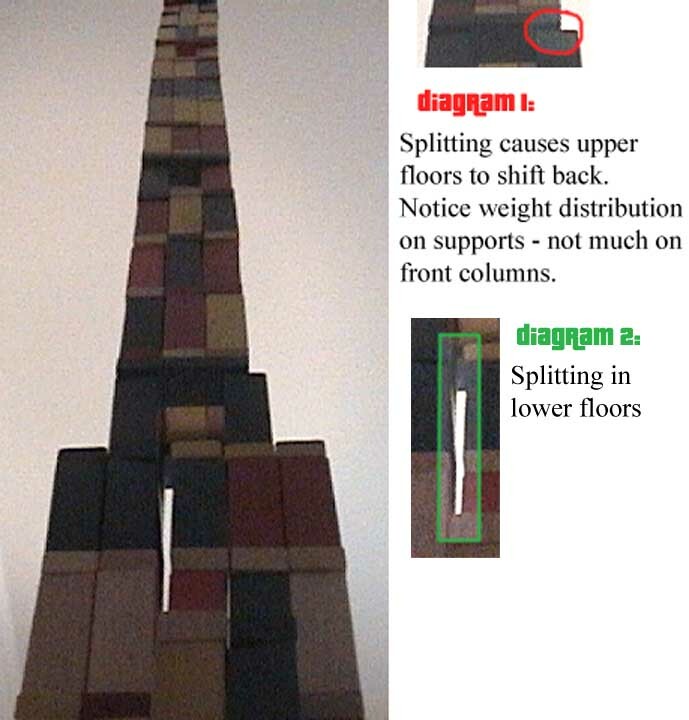 The tower was measured by tape to be 10 feet, 10 inches tall. Foil was added around the top of the fence in order to keep the cats away from both items. After the Beige Tower Incident, this tower was re-christened as "The Phoenix" because, from the rubble of Beige Tower, five floors were added to the top, and the remaining blocks were added to the bottom. At some point in May 2007, the Phoenix finally fell down as a result of my mom's boyfriend crashing into it with something. Based on his account, the tower fell swiftly and pieces were scattered everywhere. The tower had been through a whole lot of incidents, which you can read about in the Stories section, but this one finally did it in. The Phoenix (pictured near left) - 40 floors, 13' 0"
WMV file. Shot from a Sony DCR-TRV11 from front of tower's right side. 3.2MB: 45 sec. RealMedia file. Shot from the LegoCam, right up the front of the tower. 598KB: 2 min: 20 sec.